MV Parabat-11 operates from Dhaka to Barishal route. You reserve the entire launch from the Sadarghat Launch Terminal as well. Many passengers like to use this launch to travel to the route of Dhaka – Barishal – Dhaka. It offers a safe and joyful journey for the passengers, maintaining the accurate time and schedule. It contains total 900 seats and 100 Lifebuoys. But, most of the passengers traveling to MV Parabat-11 Launch are unknown of their service details and contact information. Don’t worry; this content will make sure to know all details, including counter numbers, ticket prices and other important information. You can contact with the Sadarghat or Barishal offices with the following Contact number. The hotline number: 01711 330642. 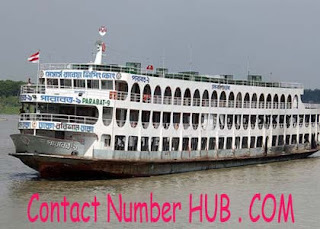 It starts from Dhaka Sadarghat at night about 8:40 pm for Barishal launch terminal. MV Parabat-11 offers the highest security to its passengers with their own employees. It has 80 life buoys and 10 types to save lives in an emergency. Moreover, it has 4 pieces of fire fighting in the launch. 👻 There is 16 toilets and 1 prayer room in this launch. 👻 There is fist aid for the emergency. 👻 It takes help from other launches when get caught in the mid-river. Sometimes, passengers should come to overcome the issues. 👻 The launch operates up to cautionary signal number 2. If the signal 3 is shown, the operation gets stopped. 👻 Illegal goods must not carry by the passengers. The authority is not liable for any illegal materials. 👻 Children under 12 years are not require tickets. Launch detail information. Stay connected with us for the further update about this service. If you have any question or inquiries, please contact us or comment in the following comment box, we shall try to resolve your inquiries as soon as possible. And finally, thanks to stay with us to read the piece of writing with persistence. May your bus journey is safe and peaceful! Ami akjon barisal er sontan..
Kaz er subada aj dhaka thaka amr. Barishal thaka aj 17/03/19 trik amr 'MA'eka parabat 11 lunch a dhaka astac.bt amr ma er kasa kno phn nay.pasar 1jon er thaka phona ma just ai tuk akbr bola clo j, baba byra onk jhor hosca..kicu somay por ma j nambr thaka phn krlo say nambra phn krlm tr nambr of..ata hotar para,hyto tr nmbr sa of rakca.bt ami kno vaba e parabat 11 lunch er hot line nambra phn kora pasce na..
Just akta information er janno..
Jodi nambr off e thkba toba kno amn nambr apnar deacn online a.abr sata hotline nambr bola.????? Prasno raylo? Parabat 11lunch er dayta jara acn tader kasa? Aj akta information neta parlm na.nodi ta akhn kmn obesta jhor hosca kena..etc..hyto amn ro onk er ma thkta para jadar kasa phn nay..tara hyto apnar hotline akta phn kora janta cayta e para akta kotha..
Plz apnar kasa onuradh apnader hotline nambr ta chalu rakhun.